It is UW – Green Bay’s branded version of Microsoft’s OneDrive for Business, which simply put, is an online (cloud) file storage platform. You may already be using OneDrive or Google Docs for your personal files, which you should continue to do, however, you should use OneDrive UWGB for all UWGB related documents and files. You can use this cloud storage space for Word, Excel, and PowerPoint documents, for photos and other graphic files (.gif, .jpg, .png), for PDF and other Adobe files, and much more. Important to note is that you should never store any sensitive information such as personally identifiable information (PII) or payment card information (PCI) data in an online (cloud) file storage platform. OneDrive UWGB allows you 1TB (terabyte) of storage space. You can sync all of your computers/phones to OneDrive UWGB allowing you mobile access to your files anywhere you have an Internet connection. You can share single documents or entire folders with others at your choosing. How do I connect to it and logon? 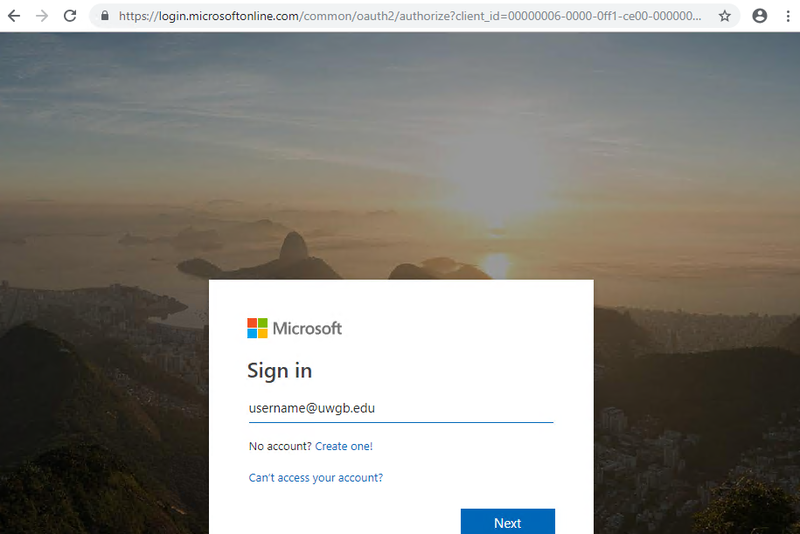 To use One Drive UWGB, login to the Office 365 Portal by going to https://portal.microsoftonline.com. 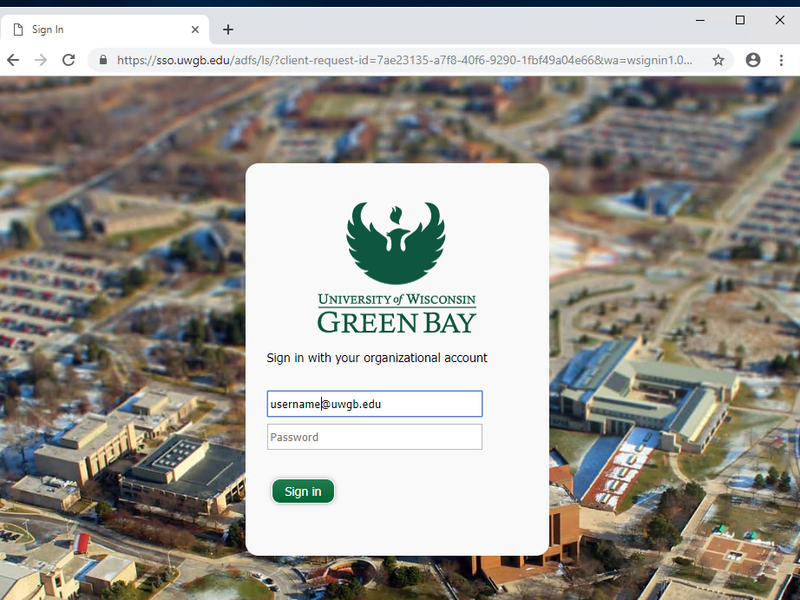 You will be redirected to the UW – Green Bay Login screen and your email address should be filled in the box. Simply enter your password for your UWGB email account. What should I see when I logon? Once you are successfully logged on your OneDrive UWGB, your files and folders from your UW Colleges OneDrive account should appear exactly as they were in your UWC account. How can I modify documents? One of the benefits of using OneDrive UWGB is that it connects to Office 365 and all the applications such as Word, Excel, PowerPoint, and more. Simply click on the Name of the document you wish to modify; the document will automatically load in a new tab within your browser. You can now edit the document as you needed. It will automatically save your changes as you work. If you wish to work in the desktop client version of one of the Office applications, you just look in the tool bar for the ‘Open in…’ phrase. 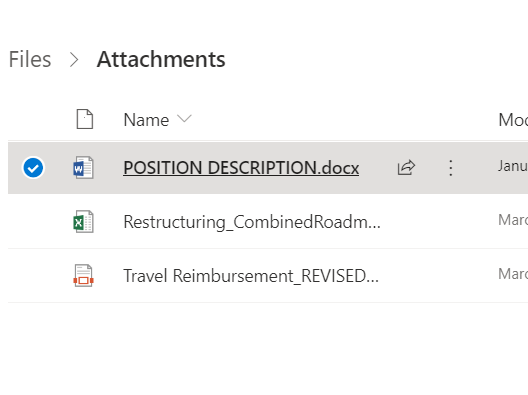 Once the document loads in the desktop version of the application, it will keep the connection between the document and OneDrive UWGB. When you are finished modifying the document save it, (though you should save as you work) and close it. The updated document will be saved on OneDrive UWGB where it was originally. If you need to add a document to OneDrive UWGB, navigate to the location within your folder structure where you want to add document. Then click the word Upload on the toolbar right below the green header bar. You will have the choice to upload a file or an entire folder. Either case, a dialog box will appear, which will allow you to navigate through the drives available to you. Find the file or folder you want to upload, click on it to select it, and click open. The file or folder will automatically be loaded. Downloading a document is simple. Navigate to the document you wish to download. Click to the left of the file name and icon, a small circle will appear and when selected it will be filled blue and have a checkmark. In the toolbar right below the green header bar is the word Download. Click the word Download and the file will be downloaded from the cloud to your download folder on your desktop. Important to note that if you make any changes to the document after downloading it, those changes will not be saved on OneDrive UWGB. You will need to upload the modified file to ensure that the versions are synced. Can I share documents with others? Yes, it is one of the benefits of using OneDrive UWGB. To share a document with someone else click to the left of the file name and icon, a small circle will appear and when selected it will be filled blue and have a checkmark. In the toolbar right below the green header bar is the word Share. A Send Link box will appear, enter the name or email address of the person with whom you wish to share the document. You can either add a message immediately and have the system send it, or you can choose to copy the link to paste into a document or email, or you create an email message via Outlook. Once the document has been shared, it will change from ‘Private’ to ‘Shared’ in the Sharing column on the right. To stop sharing a document at any time, click on the word ‘Shared’ to the right of the file name. This will bring up the Manage Access box. Click ‘Stop Sharing’, which will stop sharing with everyone. If you want to stop sharing with just one person, click on down arrow by their name and click ‘Stop Sharing’. How do I find more information about OneDrive? Check out Lynda.com for online tutorials. Sign in with your UWGB account for access. If you need specific assistance call the UW – Green Bay Help Desk at 920-465-2309.